Warner Library serves Tarrytown and Sleepy Hollow. There’s a big browsing section of new books added to the library collection. Title: Whatever Happened to the World of Tomorrow? 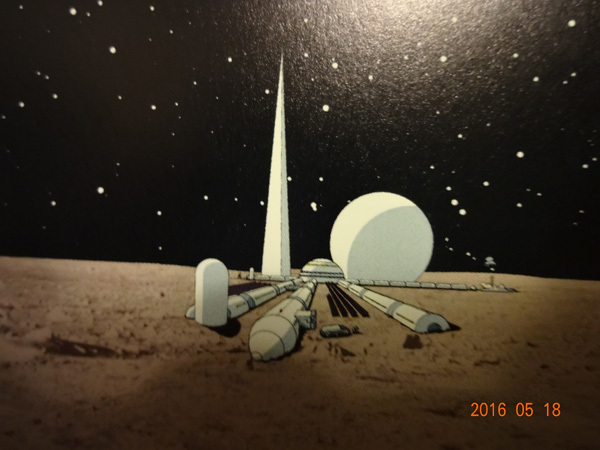 Technological innovations–Comic books, strips, etc. Fathers and sons–Comic books, strips, etc. The book centers on a father and son. The timeline of father and son is distorted; the son and father age far slower than in the real world. The son is the narrator, and the book begins with them going to the New York World’s Fair in 1939 at Flushing Meadows in Queens. From here, the book walks through the decades of the 20th century, as we see the son (very slowly) growing up. He is a teenager in the 1950s through the 1970s. What people of the time saw in terms of the advancement of science and technology–flying cars, living on other planets, super cities, etc.–would better life. It all started at the World’s Fair. Father and son, very close at that time, slowly grow apart as the 1950s give way to the 1960s and the distrust of government, which reaches a zenith with Watergate in the 1970s. The abandonment of exploring space with the end of the Apollo Program was the most glaring error made by the United States. However, even by criticizing the Earth-centered Space Shuttle Program, author Fies reveals the advances in technology that happened from the experiments made on the shuttle missions: computers, cell phones, new appliances, medical advances, etc. So, even though the future did not look like what people in the 1930s envisioned, there have been great technological advances that subtly (or maybe not so subtly) changed our lives. None was as exciting as the flying car or living in houses in the sky a la The Jetsons, but technology nonetheless has had major impacts and has reshaped society–for better or worse. As each decade is shown with the father-son interaction, there’s the evolution also taking place in a comic book–a comic book within a comic book (graphic novel): Space Age Adventures, starring Commander Cap Crater and Cosmic Boy. Changes in attitudes over time are mirrored here as well. For example, women begin as being visible with little or no power in a minor role and end up in important command positions. Perhaps the most astounding–and thought-provoking–change in the comic book is the transformation that Cap and Cosmic Boy’s arch-enemy, Xandra, goes through. In the 1930s Xandra is the typical mad scientist out to conquer the world, By the early 21st century, Xandra accepts and becomes part of the status quo. In what was the final issue of Space Age Adventures, Cap confronts Xandra. Xandra tells Cap that he can become a capitalist, sell his inventions legitimately, make billions and take over the world. Infuriated, Cap tries to arrest him only to be stopped by his former allies in authority. Cap is told that Xandra has paid for his crimes and that no one who follows the law can be arrested. Even Cosmic Boy, now finding that he has groupies, decides to stay around on Earth. Demoralized, Cap returns to his Moon base. Food for thought in this world of runaway capitalism. 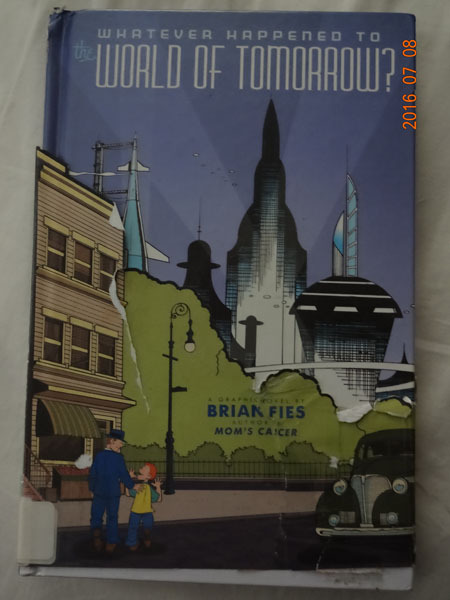 The book ends with a young girl being talked to by her grandfather–the former father–and her father–who was the son–about technology and the future. They do this from a city on the Moon. Tagged 9780810996366, Book Reviews, Brian Fies, Comic books strips etc.--United States, Fathers and sons--Comic books strips etc., Technological innovations--Comic books strips etc., Whatever Happened to the World of Tomorrow?